Where You Want to Be. 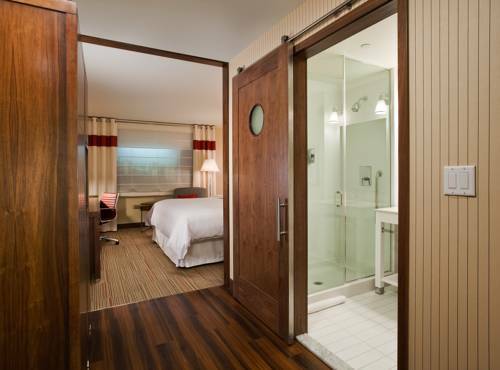 The Four Points by Sheraton New York Downtown is conveniently set in Manhattans Financial District. Walk to the citys most popular restaurants, shops, and galleries from our front door. Also nearby are Wall Street, the New York Stock Exchange, the Freedom Tower, Battery Park, and the Brooklyn Bridge, and many more renowned destinations can be reached via nearby subway lines. Work, Play, and Beer. Our hotel offers a range of meeting venues, plus a business center for support services. A state-of-the-art fitness center makes it easy for you to stay on top of your exercise regimen. And we know how to serve a refreshing, cold beer try one of our Best Brews in our rooftop bar, or grab a tasty meal in our inviting restaurant. The City That Sometimes Sleeps. We understand that the best comforts in life arent complicated. Thats why each of our 261 uncluttered guest rooms and suites has plenty of Simple Pleasures(SM), including free bottled water daily and free High Speed Internet Access. At the end of a long day, get a well-deserved night of sleep in a Four Points signature bed. Located in the heart of Manhattans Financial District, the Four Points by Sheraton New York Downtown is close to Wall Street, the New York Stock Exchange, the Federal Reserve Bank of New York, and the Freedom Tower. Pace University, Battery Park, and the Brooklyn Bridge are also within walking distance. Its easy to get around the Big Apple via nearby subway lines see Little Italy, New York University, Times Square, Broadway, Chinatown, Chelsea, SoHo, Barclays Center, and more. Visit popular museums in Upper Manhattan and enjoy amazing holiday events. And a quick ferry ride will take you to the Statue of Liberty and Ellis Island. The second-floor Ketch Terrace features a covered bar and comfortable outdoor seating available seasonally. The 29th-floor Ketch Rooftop Bar offers brilliant downtown views, as well as a full bar and light fare. Stop by the Ketch Brewhouse for casual American cuisine, plus happy hours, nightly specials, and our ice-cold Best Brews . Natural light illuminates our open floorplan and bar area, and outdoor seating is available when the weather is nice.